Head over and “like” Ruffles then click the “Get Bagged” tab to score a FREE 99¢ bag of Ruffles Chips. The site is moving slow but I was able to get through. Better hurry as supplies are limited! YAY! I have been craving pizza [no, I am NOT pregnant] for so ling now! Now we have an excuse to buy it! Enter MYBABYREGISTRYT for 100 points into yourPampers Gifts to Grow account! To sign up for your Free Pampers Gifts To Grow account go HERE. 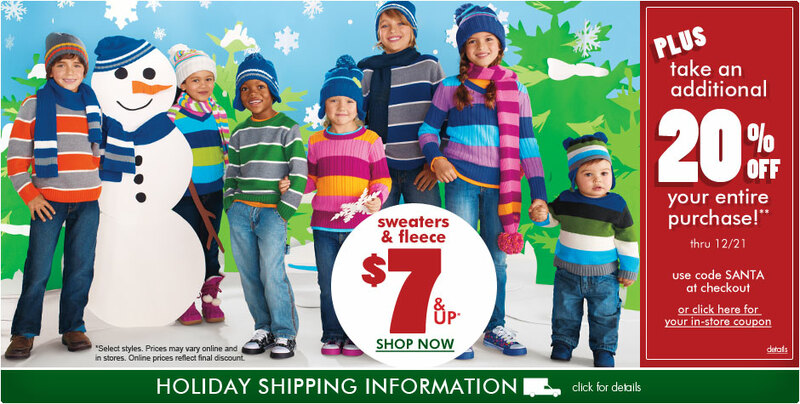 Get 20% off your order at Children's Place with Coupon CodeX3CHEAZZ12A Exp 1/2. Or 30% off your $60+ purchase with Coupon Code BUYMORE30 Exp 12/16. Sweaters and Select Fleeces start at $5. Carter's is offering FREE shipping on ALL orders! There is no minimum amount you must spend or any coupon code. This is a great deal and I encourage you all to use it. Sale ends Thursday, Dec. 16th. There is another “knock-off” of the Pillow Pets available — called Pillow Cuddlers for $8.98 shipped at Tanga. If you have a child who has asked for one, but your budget is tight (and they won’t know the difference), this might be a good alternative. TRU has started their DEALS OF THE DAY campaign again! I love this campaign as much as I love their CHRISTMAS IN JULY! Heads up on the great deals going on at AMAZON. I personally got a couple of Disney movies for our girls...I know they will love it and for approximately $12 each, you can't go wrong! Tonight, starting at 9 pm EST (8 pm CST), you can save 20% off SITEWIDE at Mattel — plus you can get free shipping! This offer will be good until 6 am EST (5 am CST) on December 10th. If you miss out on this deal – you can still get free shipping all day long tomorrow – December 10th. Use the code ONEDAY20 at checkout. Sorry – the free shipping offer won’t work after the late hours sale ends. Amazon continues to bring us some great toy deals! They've made a list of their best deals on preschool learning toys under $10 HERE (look below the description). The code for check out is FRPUMAJUST4U! I finished all my shopping, so enjoy this coupon for me! Each week I will highlight and share with you all the Palabras Sabias which in English translates to "wise words" from someone I come across or any writings I should find interesting. "Truth is....everybody is going to hurt you; you just gotta find the ones worth suffering for." There is much truth behind this! My challenge to you all is to remember this quote if you find yourself allowing either people or situations to way down on you this week. Let's remember that NO ONE or NOTHING should have such control over yourself and/or your emotions. ...should you find it necessary to remind yourself, share it with us. We are all a work in progress as long as we are getting better, all is well in the world. Thanks for the wise words Maylin [even though you had no idea I would be writing this post] & congrats on being the 1st "sabia" featured on my blog! This has to be one of my favorite stores! Enjoy this coupon as I focus on losing my baby weight and wishing I was taking advantage of this deal. It expires tomorrow, so go for it! These games are eligible for FREE shipping through Amazon Prime! Extra savings at leapfrog.com today! $20 off orders of $75, $10 off orders of $50, free ship over $50 AND extra 20% off w/promo code SAVE20. Happy Shopping & forget to let me know if you take advantage of these deals! so. as I was blogging last night it dawned upon me that I should be a bit more "efficient" in promoting and empowering my fellow LATINA bloggers! I have decided that every week I will post about a new LATINA blog in hopes that you enjoy the blog as much as I do. Since this is the 1st blog I spotlight...I had to pick something that represents me in more ways than one. I have chosen Lo Que Pica El Gallo. From their blog "Lo que pica el gallo is a blog about two Cuban girls trying to break free from office boredom by embracing the cubanisms they were taught from the womb. Grasping insight on their heritage as well as their culture all in the city of Miami." Being a "Cuban-American" born and raised in Miami, I can relate to this blog in more ways than one. I love the humor behind old Cuban saying I still hear my grandparents say. To the writers: Keep up the good work and "pa' lante muchachas"
Being that I am a Latina Blogger [and a proud one if I do say so myself...] I inquired if there was a Latina Food Blog and was so happy to hear there was. The kind Latinas over at Blogs by Latinas shared with me the Que Rica Vida food blog! I am so happy to share it with you guys in hopes that you find some yummy recipes that will bring much sabor to your home and taste buds. If you have a minute check it out and let me know if you try any of the recipes listed. Tomorrow I am trying the Empanadas de Picadillo. Wish me some much needed suerte! Welcome to Mailbox Monday!! A blog hop to boost your subscriber count! Subscribe by email to the three hostesses. They will return the favor. Visit the other blogs on the list and subscribe by email to the ones that interest you. Leave them a comment with your blog link so they know you are subscribing from Mailbox Monday. Don’t forget to confirm your subscription! Everyone is welcome to participate. Each week a new linky will be generated so make sure you stop by on Monday’s to add your blog. Your blog *must* have a place for people to e-mail subscribe.We will be subscribing to everyone’s blog who participates. If there isn’t an e-mail subscribe option, your link will be removed from the linky. The Mailbox Monday Blog of the Week is Confessions of a Vi3ti3abe which takes the #4 spot on the linky. Next week, we will choose from this week’s participants for the Blog of the Week. Help us spread the word about Mailbox Monday! Write a post for your blog and add the blog hop code. Let’s have fun and meet (and read via email) some new blogs! Subscribe to This Mama Loves Her Bargains by email!! Link up with awesome fellow bloggers! Happy Reading! Did you look through your coupon inserts today yet? Don’t miss the new $5/1 coupon in the 12/5 SS because Target has the travel edition of Hungry Hungry Hippos on sale for only $4.99, so after coupon you’ll get it FREE! I actually found the travel game near the candy at my Target (they have a bunch of Christmas stocking stuffers by the candy and the game was there). If you get a coupon inserts today, you’ll be able to get several games FREE. I’m thinking this will make an nice stocking stuffer! Dooney & Bourke 12-Days of Deals Just Started! Dooney & Bourke has just started their 12-Days of Deals sale! December 6th is the first day….but it looks like it’s started now! The sale is online and in their retail stores! If you were wanting more game coupons than just the ones in this Sunday’s paper, you are in luck! Hasbro’s $5 off game coupons are also available on-line. If you live in Miami/Broward or surrounding counties, I highly suggest you make a trip to Aventura Mall during the holiday season. It has the most awesome Christmas decorations! You almost feel you are in a mall. There is also a CHOO CHOO train for the children and adults to ride. We got to ride in the front car today which has a little rope for the children to make the train's bell sound. Our 2 year old has a field day with that privilege. We also got to visit with Santa [who is there until 8pm]. We didn't BUY a package this year since my sister-in-law took pictures of the girls, however, if you wish to buy pictures with Santa, go for it. If not, "visit" with him like my kids did today. 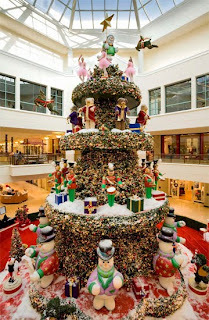 Finally, the mall's extended holiday hours are amazing. They are open until 11pm, which allows flexibility for those who work later in the night. If you take a stroll to the mall, let me know how you liked it. ...thank you for following us! starting today at 4pm and ending monday at 2pm, whoever refers the most people to our page will receive a $25 gift certificate to Olive Garden! Just have your friends state your name when "liking" us and we will keep a tally! They get a toy. You get a taco. Bring in a toy to any Lime location for our Toys for Tots Toy Drive. GOING ON NOW THRU THIS WEEKEND. Amazon is offering select Melissa and Doug educational toys on sale 50% off! This is an awesome deal! Take a peek and let me know if you buy anything! Click here for a complete list of what is on sale! TWILIGHT DVD ON SALE AT WALMART! is on sale at Walmart for $9.00. Click here for more info! Final Price: as low as $1/each!